The final and most detailed tool for making a 'diagnosis' of our security situation is that of threat analysis. As previously mentioned, threats in this case refer to any potential event or occurrence which would cause harm to ourselves or our work. Putting all of the previous exercises into practice should give us a good idea of what threats we face. In this section, we will name those threats explicitly, prioritise them according to their likelihood and potential impact, and analyse their potential causes and consequences in detail. All of this will help us to identify the right tactics to prevent them, or respond to them should they happen. Our security plans, therefore, are a combination of prevention and response tactics we use to reduce the likelhood of the threat becoming a reality and reduce its impact if it does. As with all the previous steps, this is often something we carry out in daily life without necessarily making it explicit. This process is just designed to be more deliberate and detailed, in order to foster critical thinking about our practices. Bear in mind that this can be an emotional process, but taking steps to identify and counter the threats we face can and should be an empowering step. Threats can also be a sign that our work is effective; effective enough that our adversaries want to hinder it. Let’s start with what we 'know' to be existing threats and scrutinise them. Try completing the exercise linked below to create a brainstorm of existing and potential threats. Remember - not all the threats to our well-being and security are politically motivated or related to our work. Threats also arise from petty crime, gender-based violence and environmental hazards, to name just a few. Sometimes it is these threats that can represent the greatest risk to human rights defenders. Our perception of threats is never perfect, but we can improve it. It may be that if you carry out the brainstorming exercise in a group that some people name threats that you haven't previously thought of, or vice versa. In the next exercise we pose some questions which may help you to think critically about your perception of threats and devise tactics for making your perception more accurate. the impact if and when it does. Likelihood and impact are concepts which help us determine risk: the higher the likelihood or impact of a threat, the higher the risk. If a threat is less likely or would have a lower impact, the risk is lower. By considering the threats we identified in light of their likelihood and impact, we can then move towards a deeper analysis of them, the conditions required for them to happen and their potential consequences, which will aid us in planning to react to them. Download the full length chapter to learn more on how to define likelihood and impact and apply this to the threats you have listed. It is common for human rights defenders at risk to receive declared threats from their opponents, e.g. a message from an individual, group or organisation that openly expresses their intent to cause us harm. The intention of these threats is to compel us to stop our work (at least temporarily), to punish or hurt us and discourage others in turn. Such messages constitute a special kind of security indicator because they already have a psychological impact on us and might well correspond to an actual threat. Generally, 'declared threats' are intentional (they are made with a clear intent), strategic (they are part of a plan to hinder our work), personal (they are specific to us and our work), and fear-based (they are meant to scare us into stopping our work). Declared threats may also be made or implied in our opponents' public statements or through judicial harassment or proposed legislation. They are very effective as well as “economical” because they may achieve their goal without having to carry out the actual threat made. It is important to keep in mind that while some declared threats may have concrete implications, others are intended to create new unfounded fears while no actual action to harm is planned. 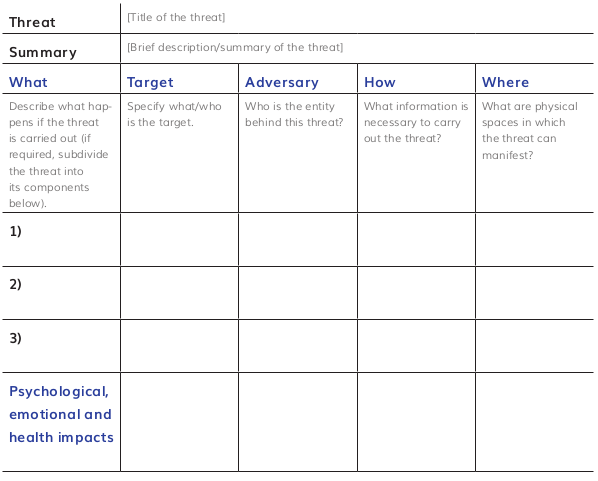 When analysing declared threats, it is helpful to go back to your actor map and consider the resources and interests of the adversary in question to know whether a genuine threat is posed. You can find concrete steps for analysing declared threats from the Front Line Defenders Hanbook on Security in Annex B. 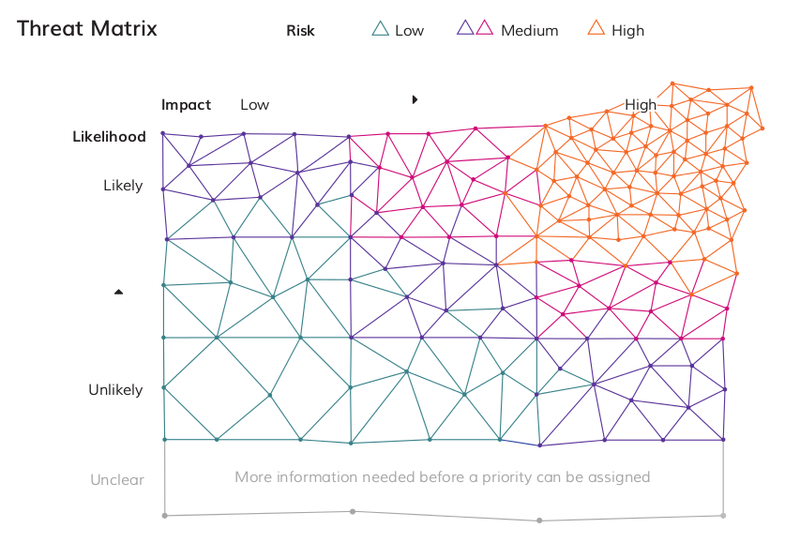 Having examined what threats we face, and considered the risk they pose (based on likelihood and impact), the next step is to create an inventory of the most high-priority threats, and analyse in detail the nature of each threat: their causes, ramifications and sources, as well as the required resources, existing actions and possible next steps you can take. This activity will lay the ground work upon which you can build your strategy to reduce the likelihood of the threat occurring, and its impact if it does. Remember that all of this will change over time, and therefore revisiting the process is very important. Determine how often you should revisit these lists and set aside time aside for it. Once we have carried out this analysis, the next step is to look at ourselves and consider how our existing practices, resources and other capacities may protect us from them, and how the gaps in our practices and resources, along with other vulnerabilities, may make us susceptible to them. Read the next Section, Strategise, to find out more.